If we understand the “spirit” to mean the animating or vital force within each person—“spirit” derived from the Latin spiritus, meaning “soul, courage, vigor, breath”—then the spirit is the vital center or our core as individuals, as persons, albeit made in the image and likeness of God, with mind, heart and soul. Thus, we surround ourselves with “spiritual” things which support this core. These are the things, experiences and realities which enliven us and give us a sense of being, place and purpose for our living. If we give care to (caregive of) another person who is disabled and needs help in activities of daily living, usually an older adult like a parent or spouse, we add the enlivening of another individual’s core. Certainly, as caregivers, our own spirit is affected, positively or negatively, by the spiritus of the one we give care to. So how do we nurture our own spiritus through those we give care to? As a Priest, I see a part of my pastoral care for others as helping to develop a deeper meaning and satisfaction in and for life. To me “things of the spirit” can bring us to a deep meaning and satisfaction in life. I know that such things can be cultivated through a rich prayer-life, along with a vigorous and balanced zest for life. Sometimes, those we give care can negatively affect our vigor and zest. So, we must take time out for ourselves. Make sure, then, that you involve others in your caregiving, so that within your family or circle of friends, you are not the only one giving care. As in all life stages, aging is a process, which is about appreciating the natural progression all of experience as we mature. I am now 65 years old, and I note that my own aging is allowing me to understand my 92-year old mother a lot better. Believe it or not, I am finding myself a lot more patient and can understand why things are slower now for myself. In this regard, I have taken on a spirituality of kairos, that is, of living in God’s time and not my own time, which is chronos. Don’t get me wrong, I am not saying that I don’t look at the clock, or my watch or my cell phone, to tell or keep time. What I am saying is that I know, more than ever, that there is a reason for everything that happens; even when something negative takes place, for which I then try to look for the positive; for the brighter side of life. At every developmental or life stage, know that one’s spiritus takes on a different perspective and meaning. In Caregiving, this perspective and meaning, can add stress to your daily life. Yet, at the end of the day, knowing that your loved one is satisfied and comfortable, and having their own spiritus nurtured through you, can be rewarding and satisfying to you, the caregiver. 1. See aging as a natural progression and live through and with it. 2. Care for yourself through your core, your spiritus. 3. Know that if you caregive, then one you give care to also has a spiritus. 4. Nurture your spiritus is made healthy through your own spiritual and physical life. 5. Be a caregiver who involves others in the giving of care, so that you can “take time out” for relaxation, recreation, fun. 6. Balance your life; make a schedule while being flexible. 7. Be patient and know that time is really a gift from God, which means you have the time to do what needs to get down, for yourself and others. 8. Pray daily, even while exercising or doing something you like to do, asking God for the wisdom and understanding to know your sense of place, of being and of purpose. 9. Know your sense of place, of being and of purpose, as you give care to the disabled one needing it, to feel satisfied and fulfilled. Caregiving is not easy. It can get stressful and difficult in many ways. But I believe that looking at this responsibility through your spiritual reality, through your spiritus, can help make a difficult task a lot easier. If you need to speak to me more about this, please send me an email and I will get back to you. Have an idea or a comment or even a question, contact me at this email address: atingkabuhayan@gmail.com. Until my next column, please take care! Rev. 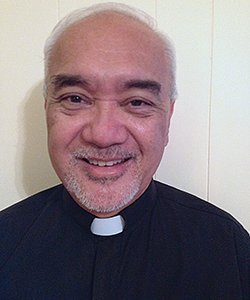 John A. Hau’oli Tomoso † is a Social Worker and Episcopal Priest. He is a Priest Associate at Good Shepherd Episcopal Church in Wailuku and an on-call Chaplain at Maui Memorial Medical Center. Tomoso was graduated from St. Anthony Jr./Sr. High School, the College of St. Thomas in St. Paul, Minnesota (Bachelor of Arts in Political Science and Sociology) and Myron B. Thompson School of Social Work at the University of Hawai’i at Mānoa (Masters of Social Work). In 2008, he retired from the civil service as the Maui County Executive on Aging. Tomoso is currently the Executive Director of the non-profit Tri-Isle Resource Conservation and Development Council, Inc. His wife Susan is a 7th grade Language Arts Teacher at Maui Waena Intermediate School.